Three young suspects knocked over more than three dozen headstones in a 225-acre cemetery Tuesday and vandalized them with derogatory graffiti, authorities say. Erica Byfield reports. Three young men suspected of desecrating a New York City cemetery, vandalizing dozens of headstones with the "N-word," human feces and Asian slurs in a vandalism spree captured on video, now face hate crime charges. Brunco Camacho, 22; Edward Evseev, 21; and Mark Barranco, 21, were arrested Monday on hate crime charges of criminal mischief, burglary, cemetery desecration, aggravated harassment and other offenses. 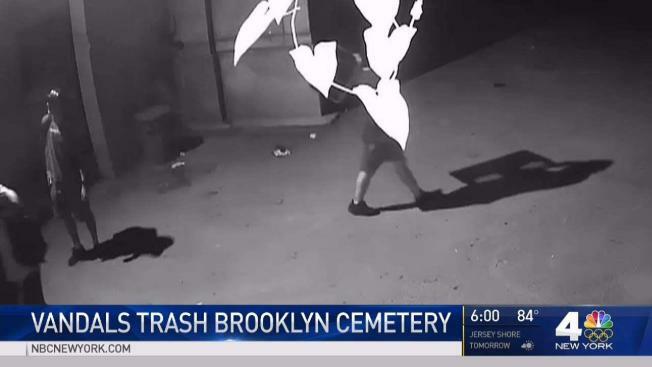 The three allegedly knocked over more than 70 headstones and damaged another 48 in the 225-acre Cypress Hills Cemetery along the Brooklyn-Queens border just after midnight on Aug. 15. Officials said they also broke into a mausoleum and damaged the marble stones on the front of about 15 vaults. Biased graffiti was also left there. Officials estimate they caused about $100,000 in damage. "Even in their eternal rest the dead of Queens County cannot escape from the bigotry and hatred that brews in some people’s hearts," Queens District Attorney Richard Brown said in a statement. "In Queens County, the most culturally diverse county in the nation, crimes of hate will never be tolerated and we will do all in our power to root out those responsible for such hate and prejudice." Bail was set at $70,000 for each defendant; they're due back in court next month and each face up to 15 years behind bars. Attorney information wasn't immediately available. Stacey Cullen, an official at Cypress Hill Cemetery, previously told News 4 the damage left her dumbfounded. "You hear about it happening but when it actually happens to the magnitude to what it was, it's very upsetting," she said. "We take pride in our job. We take care of people's family members, so to see this happening, it's very upsetting."